The inner north jetty at Barview Jetty County Park is a great place to go spear fishing and crabbing. We have caught many lingcod and dungeness crabs here. The current along the inner north jetty can be a little tricky and the entrance and exit is grueling at high tide but the hunting here is good. Be sure to have your fishing license in order and be extra sure that you are only catching things that are legal to catch and the correct size. We have had the state police called on us more than once by angry fishermen who didn’t want us spearfishing in their favorite fishing spot. Each time though, we were in the clear and the fishermen ended up getting tickets for not having their fishing licenses! The main highlight of the Barview County Park dive site is spearfishing and crabbing. The current usually moves along here too fast to go slow and check out the micro marine life. There are other sites in Tillamook Bay such as The Three Graces (also known as Crab Rocks) and the Lumber Dock that are better for checking out tiny sea creatures and going slow. Barview, Oregon (the zip code is 97136. Don’t accidentally go to the Barview on the Central/Southern Oregon coast. Sometimes Google Maps will try to navigate you to the wrong Barview!) is the closest small town. Garibaldi is just down the road a mile or two and has more services. Tillamook is the closest large town. Look for Barview Jetty County Park signs along US101. Cedar Street takes you right down to the parking area. The Barview Jetty Store and Deli (it was called this the last time we were here but the name could change) is at the southwest corner of the intersection that you take to get onto Cedar Street. At the end of Cedar Street there is a large gravel parking lot that overlooks a tidal area full of rocks. Beyond the tidal area is the inner north jetty. This is just outside of the pay station for the campground and the rest of the park. There are two other dive sites further west along the jetty that you have to pass through the pay station to reach. This dive site doesn’t require you to pay as of the last time that we visited. The Barview inner north jetty dive site is a great place to spearfish and go crabbing. The site runs roughly east-west along the jetty. Keep the jetty to your north and don’t let yourself get sucked into or out of Tillamook Bay by the current. Depending on what side of high tide you dive this site on, the current will try its hardest to pull you away from where you want to be. If you find yourself heading west, you could exit at the middle north jetty dive site or the outer north jetty dive site and have a long walk back to your car. There are two entrances/exits that we have used near the parking area. These are low spots in the jetty. 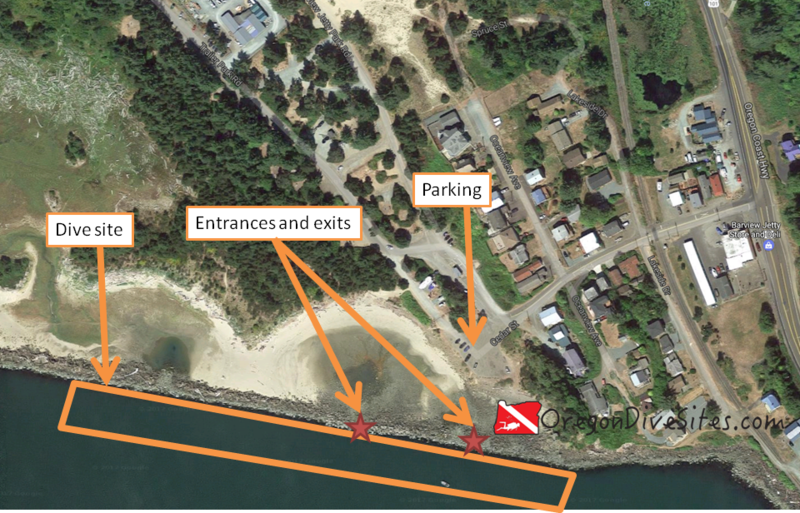 Getting to the entrances is difficult at high tide because the tidal flats between the parking area and the dive site are full of rocks and knee-to-waist-deep water. You can’t swim in this water so you have to slog through it. Wading through water wearing 100 lbs of SCUBA gear and trying to avoid tripping on unseen rocks really saps your energy. At the jetty, you have to do the typical Oregon jetty scramble to get to the inner north jetty dive site. There is always current here. Slack tide lasts only a few minutes. The rest of the time, you’ll be getting pushed or pulled by the current. Sometimes the wave sets coming in from the ocean line up just right to put some waves on the inner north jetty but usually you only are dealing with current here. This is a favorite spot for fishermen. Be mindful of fishing lines and bring a safety shears in case you get tangled in line. We have a safety shears we highly recommend on our Gear We Use page. Usually visibility is around 10-15 feet here although the rivers coming into Tillamook Bay can produce a lot of sediment after a big winter storm that can significantly reduce visibility. Usually we have seen between 48 and 55F at this dive site although if there has been a lot of cold rain upstream of Tillamook Bay, it can be colder. This site can be SCUBA dived any time during the year. Max depth at the inner north jetty is around 40 feet. We suggest having advanced open water training for this site. This is a typical Oregon jetty entrance with an extra long slog through annoyingly placed rocks and knee-to-waist deep water. This would not be a good place to have your first jetty entrance experience. The inner fingers at Newport (first or second) would be a better place to try jetty entrances for the first time. We rate this as an intermediate dive because of the annoying entrance and the climb over the jetty rocks. The current also factors into our consideration here. Depending on which entrance you use, you’re looking at a 150-300 foot walk through water and rocks before you get to the jetty. No surface swim needed here. Be mindful of sport fishermen and hobby crabbers. We must share our spaces to continue being invited back as SCUBA divers. Watch the current. We suggest going against the current at the start of your dive if you have already passed slack tide. If you are straddling over either side of high tide, then you can drift in with the current and back out after the tidal exchange has switched. There may still be a local dive shop in Tillamook but we haven’t checked in with this shop in a while. If you know of any shops in the Tillamook Bay area, please let us know! We haven’t tried out any of the restaurants around the inner north jetty but in Tillamook there are several decent places. Let us know if you have a favorite place to eat here! The Tillamook County Barview Jetty Park has a campground with a bunch of spaces for RVs, tents, and anything in between. They also have some cabins for rent. We haven’t tried any of the hotels in the area yet. If you know of a good hotel that is SCUBA diver friendly, please let us know!